Downtown Host Review 2019: Is Downtown Host a Good Hosting? DowntownHost was founded in 2001 as a pocket-friendly web hosting service with an array of plans designed for scalability. They have servers located in four cities throughout the United States, a data center in Singapore, and another one in the Netherlands. The privately-owned DowntownHost was founded in 2001 as a simple reseller hosting service. They’re still a reseller host at this point, but it appears they’ve upgraded their array of web hosting services to include far more than just shared hosting. They’ve now got servers located in four cities throughout the United States as well as another data center in Singapore and a final one in the Netherlands. DowntownHost offers their customers a full array of web hosting services: affordable shared hosting plans, reseller packages, VPS hosting, semi-dedicated servers, and dedicated servers. In general, their servers are reliable with excellent uptime: my brief tests reported that there were only three instances of downtime in the past two years. They give their users a generous amount of resources to start off with: their Starter shared hosting plan gives you 5GB disk space, 100GB bandwidth, and unlimited add-on domains and email accounts. Having no cap on the number of add-on domains was a nice touch; I rarely see that with entry-level shared hosting packages. DowntownHost purports to have a 99.99% uptime guarantee on their “About Us” page, but this appears to be slightly misleading: their SLA actually promises a 99.9% uptime rating. This is still decent by industry standards though. Getting started with DowntownHost is simple enough: they offer their customers the easy-to-use cPanel, along with one-click app installers that include all the most popular CMSes such as WordPress, Drupal, phpBB, Magento, Joomla!, and Prestashop. They also throw in a free Comodo AutoSSL with all shared hosting plans, so you’re pretty much set up with everything you need to successfully maintain a website. DowntownHost’s prices look too good to be true at first glance – for the resources and features they’re offering, their prices are well below regular market rate. But upon closer look, it turns out that you have to sign up for a contract of at least three years to get their best rates. That said, when that’s been taken into account, their prices are still pretty decent and on par with most of their competition. You’ll even be able to host multiple domains with just their entry-level shared hosting package, since it includes unlimited add-on domains. Bear in mind that none of these shared hosting packages include a free domain registration – not even if you sign up for three years. All shared hosting accounts come with a 30-day money back guarantee. You’ll need to notify them via their Help Desk to be eligible for the refund – but make sure you back up all of your data before you do so, because they’ll terminate your account immediately upon receiving notice. DowntownHost claims they make support available through live chat, email, and a ticket system. However, their email support was basically unresponsive when I contacted them via the form on their website, and when I tried to access their live chat, they took half an hour before they got back to me. Their knowledge base was equally disappointing: the link is broken, and although you can still get to it by googling “downtown host knowledge base,” it takes an incredibly long time to load the database. It seems from other reviews online that their support used to be amazing, but has drastically dropped in quality since then. 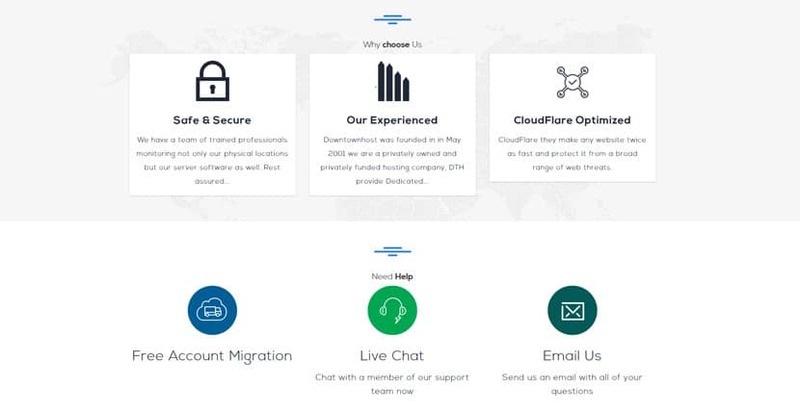 All in all, DowntownHost is a budget-friendly choice of web host with reliable servers. However, if you host multiple websites with them and generally require more customer support on a regular basis, they may not be up to standards. Wondering how Downtown Host stacks up against other Web Hosting companies? Enter any other Web Hosting company and we will give you a side-by-side comparison.